This activity uses the history of the Olympic Games to introduce ideas about measuring time and distances in standard units, and is designed to be accessible to primary pupils at Key Stage 2. 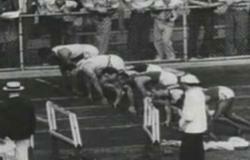 This is the start of the 100 metres in 1896. 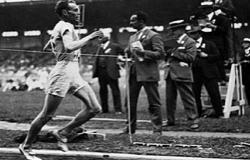 In that year Thomas Burke from the USA won the race in 12 seconds. I wonder how far you could run in 12 seconds. This is the finish of the 200 metres 4 years later. Robert Kerr from Canada won that race in just over 22 seconds. I wonder if you could run the 100 metres in that time? Or you could see how far you could run in 22 seconds. 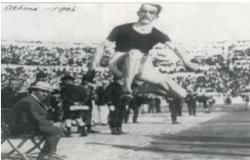 This is the high jump in 1906. It shows Ray Ewry from the United States. He jumped 1 metre 56 centimetres. See how high 1 metre 56 centimetres is. This is the long jump. In 1906 it was Ray Ewry who won again, as he won in 1904. This is a standing jump with no run-up. 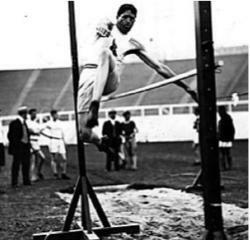 He jumped 3 metres 47 centimetres in 1904 and 17 centimetres less in 1906. You can find out more about the 1896 and 1904 Olympic Games on the Olympic.org website. There's more about the 1906 Intercalated Games on Wikipedia.